The wisteria is a beautiful and elegant plant common in the regions of the eastern United States and to China, Korea, and Japan. This flowering plant features draping vines and vibrant lilac blossoms, and its appearance creates the sensation of harmony and peace to on the onlooker. The wisteria plant is known to live for upwards of a hundred years, even living centuries. Because of its extensive lifespan and elegance, the wisteria is thought to be a symbol for wisdom. 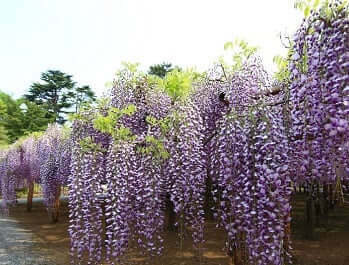 Throughout its life, the wisteria plant grows increasingly larger. It expands as it takes on new wisdom and experiences. The long vines of the plants are forever extending to seek new knowledge. For this reason, the plant serves as the perfect symbol of wisdom, patience, longevity, and endurance. From its example, we can learn to practice patience and persistence. It can teach us to make gentle but determined pursuits. Many great things take time and are worth the effort. Hard times must be endured in order to reach the beautiful ones. These motifs of wisteria symbolism extend into the creative realm. The extending vines of the wisteria are unique in their beauty. The way that they extend and drape over the landscape is a perfect example of how the wisteria plant symbolizes personal expansion and creative exploration. The plant never stops growing and never settles – a lesson that can be applied to all of our lives. Continue to discover new hobbies and interests. Challenge yourself to see the world through a different lens. Through the exploration of the world around us, we can also reach new levels of self-discovery. The wisteria plant symbolism is notably beautiful, elegant and graceful. Because of its appearance it is a perfect reminder of love, grace, and bliss. These concepts intertwine like the vines of the wisteria – intersecting and affecting each other. In order to find a true and blissful love be graceful. Practice patience and kindness to those in your life. The longevity of a wisteria’s life allows it a unique wisdom. The wisteria encourages us to and practice love through generosity and selflessness, and knows true beauty takes time. Being gentle and patient teaches us to see things in a new light – simply slow down and take in your surroundings. Like the wisteria, we should strive to be connected to the world around us. Through this practice, we can attain a higher sense of inner peace and a better understanding of our higher purpose. A final note from the wisteria plant symbolic meaning is one of nostalgia and memory. The wisteria is witness to several generations and absorbs lessons from every time period. The plant knows that valuable lessons are hidden away in our pasts and that we can learn from previous mistakes and the mistakes of those who came before us. Take these mishaps and turn them into strengths. Like the plant, practice strength and resilience. The wisteria meaning represents a wide range of ideas, but if the imagery of the plant speaks to you, it is likely that one of these lessons can be applied to your life. The universe finds a way to speak to us all the time. By opening yourself up and allowing yourself to receive the messages, you can gain valuable wisdom. The world is full of endless lessons, but we hold the keys to discovering that information.